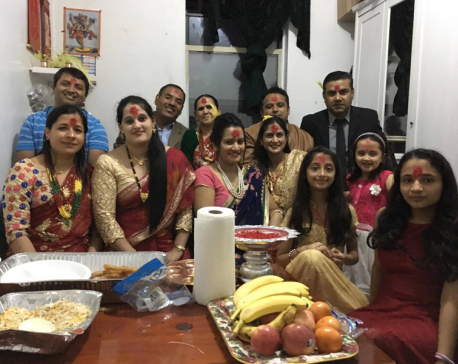 Pre-Dashain is the time when short-term returnees outnumber those headed abroad in search of work. Be it at the Gadda Chauki in Kanchanpur, the Jamunaha Gateway near Nepalgunj or the Belahiya Naka of Bhairahawa, steady stream of weather-beaten workers can be seen heading home toward mid-mountains for a well-deserved break. Their backpacks often look bulkier and most of them appear relieved to be on their own soil. At the Tribhuvan International Airport too, the size of baggage tied with plastic strings is bigger. Unlike in the past, many Nepalis working in West Asia and Malaysia these days are Madhesis. The realization of being on home grounds doesn’t come to them as naturally when they enter the terminal building in Kathmandu. One doesn’t have to be a keen reader of emotions to see that most Madhesi returnees remain anxious as they negotiate their way through the immigration and customs where almost nobody speaks their language. In a country where Gorkhali ethno-nationalism has been the dominant ideology of governance since its inception, it’s not easy for non-Gorkhalis to feel at home even inside their own homes. From the hills and mountains of western Nepal, many workers would return to their stations soon after Dashain. Especially for those employed in the Indian private sector, Deepawali is the time when bonuses are granted and gifts are distributed by business owners. For lowly employees, it makes more sense to forego Tihar festivities than miss the opportunity of being there when incentives and increments are to be distributed. Madhesi workers often stay back till Chhath. Many return only after the rice has been harvested, husked, and stored or sold. Some prolong the leave by a month if marriages of siblings or offspring are planned. It takes a while to repair leaking roofs or build toilets close to the hut on tiny plots. Then they will go back to the grind in foreign lands with a new picture of the family as the screensaver on their cellphones. Remittances from migrant labor have remained the mainstay of Nepali economy since historic times. When Maharaja Ranjit Singh (1780-1839) of Sikh Empire, a contemporary of Gorkhali Mukhtiyar Bhimsen Thapa (1775-1839), began his expansion spree north-westwards, he found that what the British would later call ‘short men with stout legs and strong lungs wielding sharp Khukuris’ were much more than worth their weight in salt in mountain warfare. Such Gorkhali mercenaries—including Balbhadra Kunwar of the Nalapani fame in the nationalist narratives of Nepali history—institutionalized the tradition of Lahures, which is called so after the capital of the Sikh Empire in Lahore. The rise of Jung through chicanery and the recognition of usurper by the East India Company; the Lucknow Loot in 1857; Chandra’s loyalty to the Allies during the World War I; and Juddha’s unwavering allegiance to the British Crown in World II meant that the greatest colonial power of the world was also the biggest employer of Gorkhalis. Conscientious economists that lament about excessive reliance of Nepali economy on remittances often forget that the situation has remained more or less the same for over two centuries. With almost nothing of value to export, everything outside of subsistence economy had to be paid for by the money that Nepalis working abroad remitted home. Nearly a third of Nepali economy is directly dependent upon remittances. In an indirect manner, nothing outside of agriculture is independent of money transfers from abroad. No wonder, little flashy booths hawking the services of filling out EDV forms attract the attention of so many gawkers at urban centers. While the Oligarchy has encouraged youngsters in the source country to go out as fast and as far as they can, aspirants often know little about the attitude of Trumpards toward economic refugees in their destination nation. Meanwhile, those that have stayed home don’t have much to do but sit back and enjoy the fruits of sweat and blood of their compatriots toiling abroad. Banks make profit by lending to traders and consumers. Retailers find that their stock is sold faster than they can replenish irrespective of the price. With its entire revenue system based on taxing imports, the government has little incentive to explore avenues of export. Except for workers that have to keep the system functioning by building toilets, collecting garbage, delivering vegetables, erecting or repairing houses and supplying essential services in the health and education sector; all of the middle-class and everyone upper than that in Nepal are on a perpetual holiday mood. They treat their jobs at banks, insurance agencies, malls, NGOs, government agencies, parastatals, transport services and foreign aid missions more as a diversion from the boredom of daily routine than a duty that they have to perform to earn a living. Traditional traders have long held that if it were not for the market created by rites of passage such as birth, coming of age, sacred thread, engagement, marriage, death and customary homage to ancestors at the Shraddha ceremonies, they would have long gone out of business in an area of abject poverty and despicable inequalities. Migrants to the capital city from the plains, hills and mountains have brought all those social and cultural obligations along and added commercial celebrations—the Valentine’s Day for example—to the burgeoning list. Kathmandu already has its long roll of annual Jatras. Little wonder, everyday is a festival in the city of consumers; and remittances keep the wheels of economy churning just as profits from the trade with Tibet did during the Malla-era. With all this happening all year round in the town, where is the time to read anything other than asocial media feeds and newspaper headlines? Asocial media—cleverly named ‘social media’ by its promoters and publicists—are great for the narcissists of the ‘selfie-generation’ that are happy in the bubble of their followers. Even before Trumpards popularized the ‘fake news’ phrase, daily newspapers haven’t been too well-known for deepening understanding. Reading books is an established way of saving oneself from being drowned in the flood of information and escape to the high ground of knowledge. 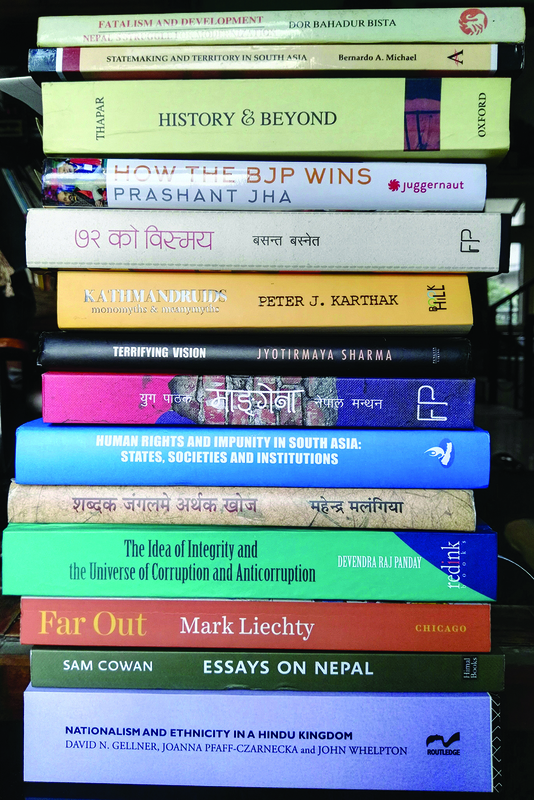 Perhaps Dashain is the time to forego that foreign trip, take a leave of absence from the ritual indulgence in red meat, binge drinking and gambling and stay back in Kathmandu to spend the holidays in the company of books. The money thus saved can change the life of a poor student or a sick person back in the ancestral village where the presence of a relatively well-off person from the city during Dashain has begun to cause more resentment than joys of togetherness as people become increasingly self-centered in the age of incessant comparison of everyone’s consumption levels. There is no better way to begin one’s explorations than reading—or re-reading—Dor Bahadur Bista’s classic Fatalism and Development: Nepal’s Struggle for Modernization. Bista’s exposition of Bahunism remains the best explainer of the dysfunctional state and maladaptive societies of Nepal. A complementary compilation with a longwinded title—Nationalism and Ethnicity in a Hindu Kingdom: The Politics of Culture in Contemporary Nepal—edited by David N. Gellner, Joanna Pfaff-Czarnecka and John Whelpton isn’t exactly contemporary in the oligarchic republic, but its insights still enlighten readers. At least a rudimentary idea about India is necessary to make sense of the zeitgeist in South Asia. More learned volumes have since been published, but Jyotirmaya Sharma’s Terryfying Vision: M. S. Golwalkar, the RSS and India remains the most succinct introduction to the politics of Hindutva. If Sharma dissects ideology, Prashant Jha describes its mechanics in How the BJP Wins: Inside India’s Greatest Election Machine. General Sir Sam Cowan’s newly-published collection Essays on Nepal: Past and Present uses materials not easily available or accessible to ordinary writers and explores various facets of Britain-Nepal, Nepal-China and Indo-Nepal relations from the security angle even as the volume investigates people, places, events and conflicts of a country close to the author’s heart. Stories of history and society of Nepal from the perspective of Dalits, Janjatis and Madhesis remain to be written in any language. Until such works materialize, the only way to get their version is to listen to their woes first hand. Such an effort, however, may necessitate travels around the country, which is best done during the dry season after the winter. A shameless name dropping by way of full-declaration at the end: All writers mentioned in this piece are personally known to this columnist. On that immodest note, Happy Dashain!